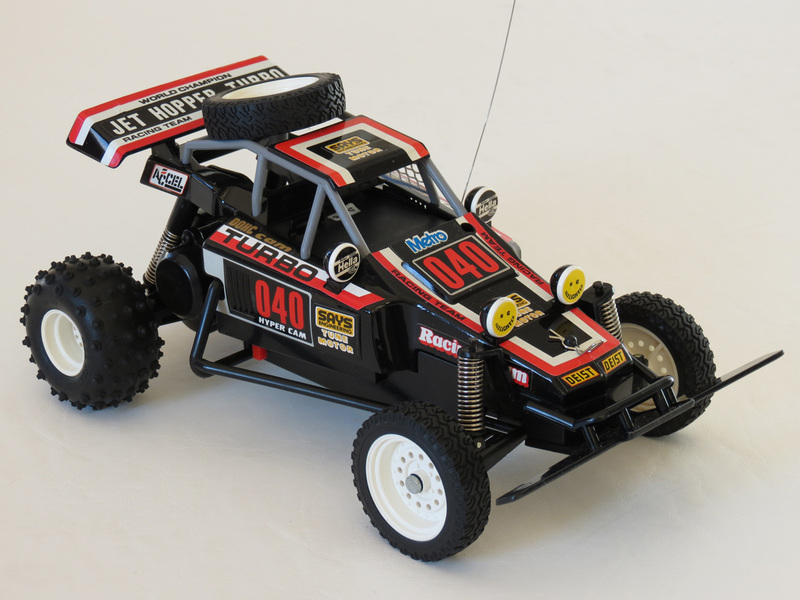 In late 1987 and through 1988, the top selling 1/10 scale R/C car in Australia was the “The Fox” by Tamiya. The Fox managed to sell about 20,000 units during this period, outselling the rest of Tamiya’s popular range (including The Frog and The Hornet), and easily eclipsing the sales of 1/10 scale cars from other incredible Japanese brands like Kyosho, Marui etc, along with the American company Team Associated. Taiyo Jet Hopper (Japan) Original Japanese release. It came in three variants. But while Tamiya dominated the 1/10 scale R/C market in those days, people often ask me today “why weren’t the other brands equally popular?” (given they often had equally stunning, and in many cases faster cars for competition). The answer to that is marketing, distribution, and “being first to market”. 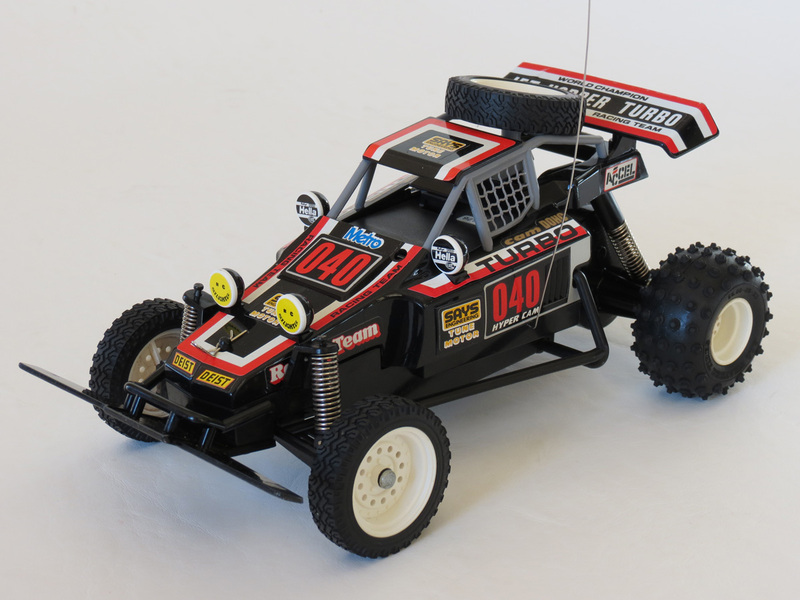 Tamiya were the first to popularize electric R/C. They also had great distribution, marketing and spare parts support. Oh, and their cars were highly evocative, memorable and well-made. 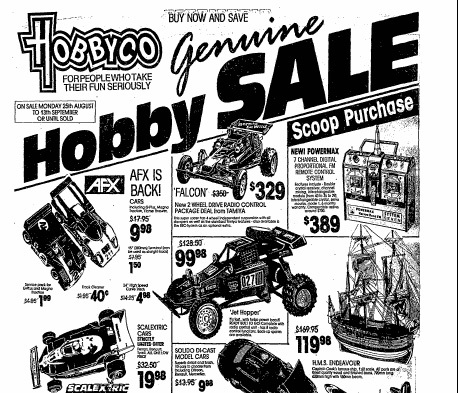 But in truth, Tamiya did have serious sales competition in the R/C market during the second half of the 1980s. It just didn’t come from where most people assume it did. Think again about those 20,000 Foxes that were sold in Australia during 1987/1988. 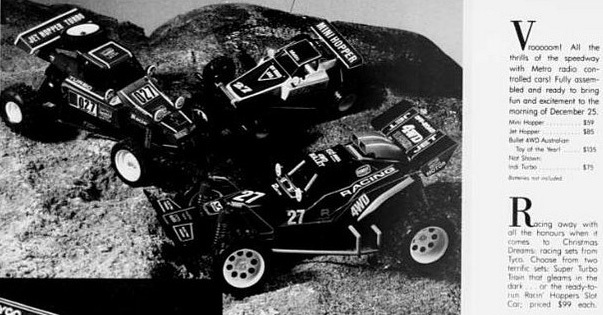 Tamiya even heavily discounted around 7000 of those Fox kits for Christmas in 1987, resulting in them being sold in some very unusual places – such as Franklins and Woolworths supermarkets. 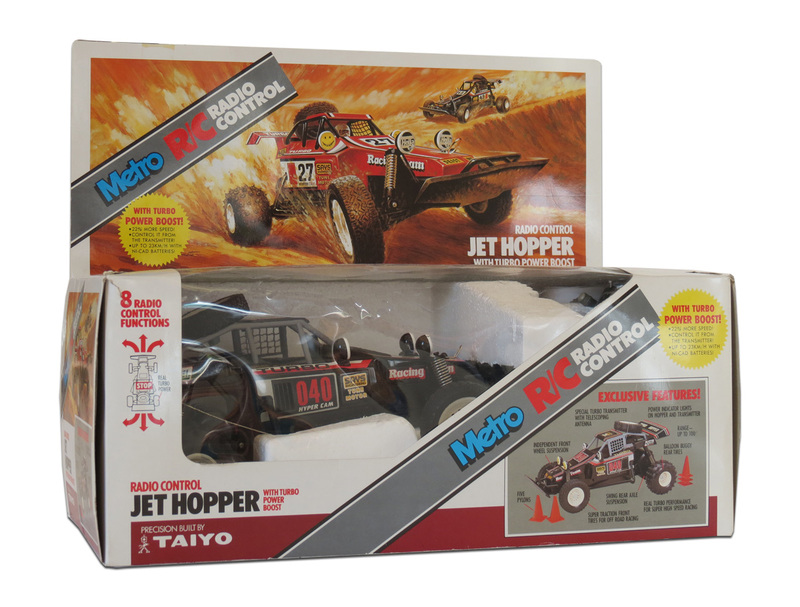 But now consider this: In 1987, Taiyo sold 150,000 units of it’s Jet Hopper R/C car in Australia. 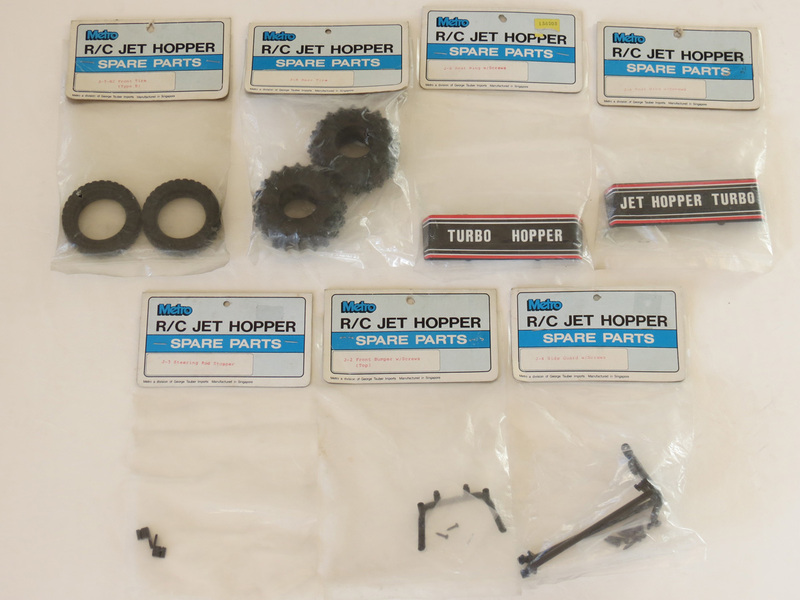 During 1986/1987, the total number of Jet Hoppers sold in Australia topped 300,000. And there can be no doubt that at least a portion of those sales also represented lost sales for Tamiya. Tamiya may have been the kings of the 1/10 scale market in the 1980s. But the biggest threat to their dominance of R/C came not from their 1/10 scale kit rivals, but rather, from other Japanese companies like Taiyo (and Nikko, or even Radio Shack) who had specialized for many years in making solid, ready-to-run, smaller (mostly 1/14 – 1/18 scale) R/C cars that were more affordable and easier for kids to get straight outside and play with. By 1988, the impressive sales of these companies actually caused Tamiya to move into 1/14 scale ready-to-run cars themselves (see: Tamiya’s “Quick Drive” line of cars) perhaps in an effort to keep their brand visible to kids (and parents who didn’t want to build kits!). And so, with 2016 marking 30 years since the release of the Jet Hopper, what better time to write a little more about it – this time, with a focus on those hundreds of thousands of Jet Hoppers that Australian kids found under their Christmas trees. 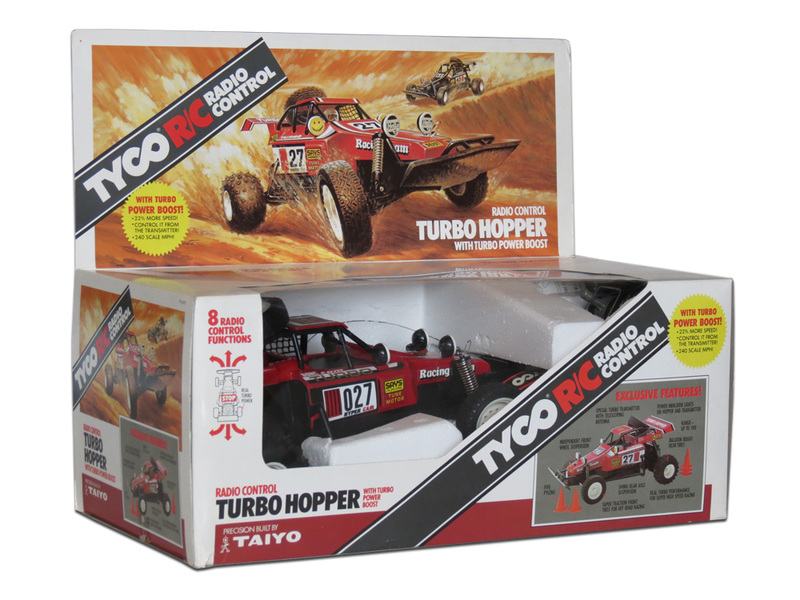 You’ll notice it was packaged virtually identically to the American release where it was sold under Tyco/Taiyo branding. There are some slight differences between the Jet Hoppers sold in Australia and those sold elsewhere in the world. But to be honest, they are all very similar. So don’t feel too bad if you can’t find a good Australian one to buy, because the main differences between the Australian one and those sold internationally are little more than the brand on the box and a couple of decals. And possibly the front bumper. The “Metro” brand used in Australia was a popular toy brand in Australia for a few years from the mid 1980s until the 1990s. It was a brand name marketed through retailers, but actually owned by another company called GTI (George Tauber Imports Pty Ltd), who themselves later became Playcorp. 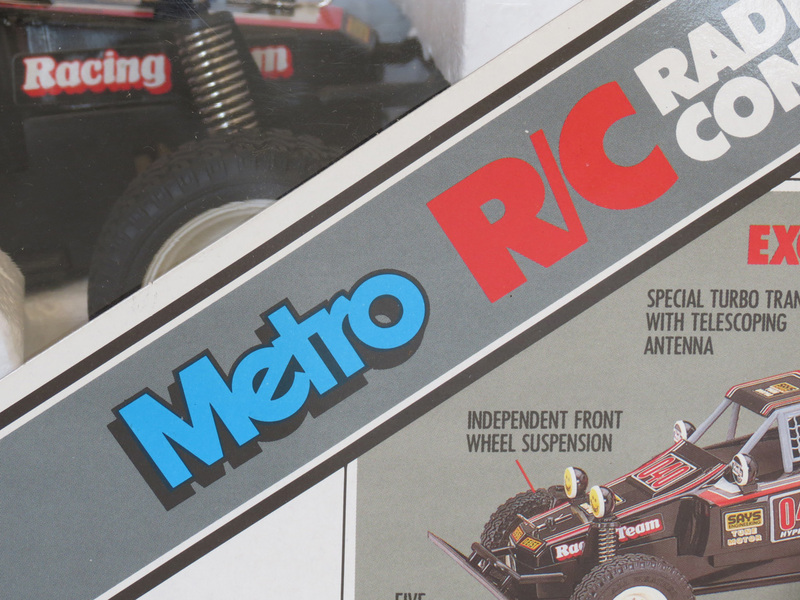 I can clearly remember seeing the “Metro” brand on a few different toys (not just R/C cars) that were sold at stores like K Mart back in the 1980s. It’s strange that the brand’s once-common blue logo appears to be largely forgotten today, and a quick google search for it seemed to turn up next to nothing (except my own website!). 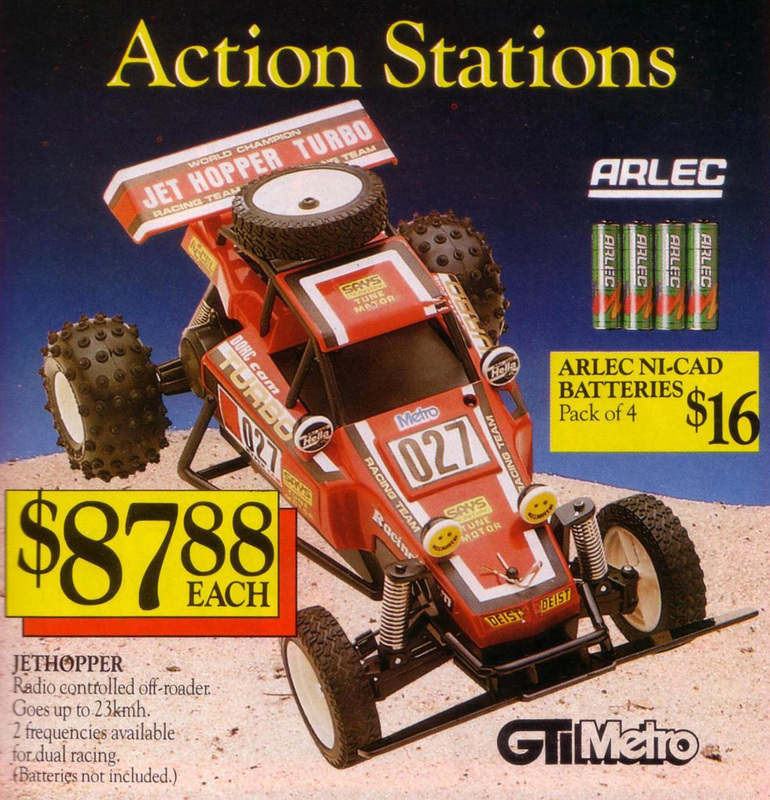 The Jet Hopper was the first R/C model imported and sold by GTI under the Metro brand. The style and marketing of the product appeared to mirror (pretty much identically) the way it had been launched in the USA through Tyco – hence we got the rectangular, windowed box with the huge backing card adorned with great artwork (which almost certainly must have been illustrated by an artist from Tyco in the USA). It was otherwise very similar to the first variant of the American Tyco/Taiyo Turbo Hopper – in other words, it had the LED light on the bonnet, low profile front tyres, and fat spike rear tyres, and a solid front bumper (with no writing on it). Although it lacked the little antenna-tip flag they had in the USA. Like the US release, the Australian release also came with paperwork and some bonus “witches hats” (as we call them – “traffic pylons” to the rest of you! ), which was an extremely cool little accessory to throw in as it gave kids something extra to practice their driving skills with. 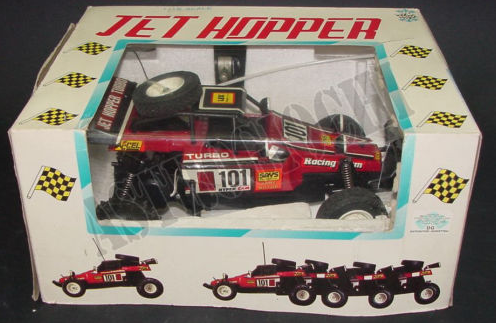 International Jet Hoppers never came with them, and I suspect it had been the US company Tyco’s idea to include them. One of the bits of included paperwork was a spare parts sheet. 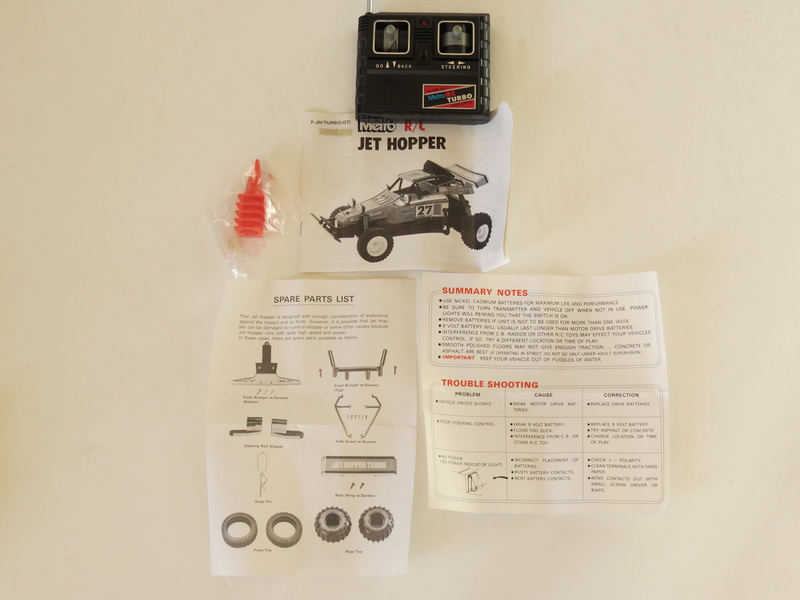 Even though the Jet Hopper was a 1/16 scale ready-to-run buggy, much smaller than a Tamiya, the creation of a line of spare parts meant it felt a lot like this little car aspired to be a larger kit-based car. It was a fantastic thing to do, and was undoubtedly responsible for some of Taiyo’s resounding success with this car – giving the toy some actual longevity that went beyond the very first accidental smack into a roadside kerb, or the first set of thoroughly bald tyres. The novelty of this parts support lasted only a few years unfortunately, before most of the ready-to-run R/C cars on the market went back to having few (if any) spares available at all. But while it lasted, you could easily buy new sets of tyres, bumpers, and a few other things for your Jet Hopper from either your local hobby store – or even from places like Supermarkets. I can clearly remember seeing them hanging on the racks at K Mart and hobby stores. Today of course, some of those spare parts – in particular the tyres – are rare gems for collectors and restorers. So that’s a quick wrap of the (just slightly) different way in which Jet Hoppers were presented here in Australia. 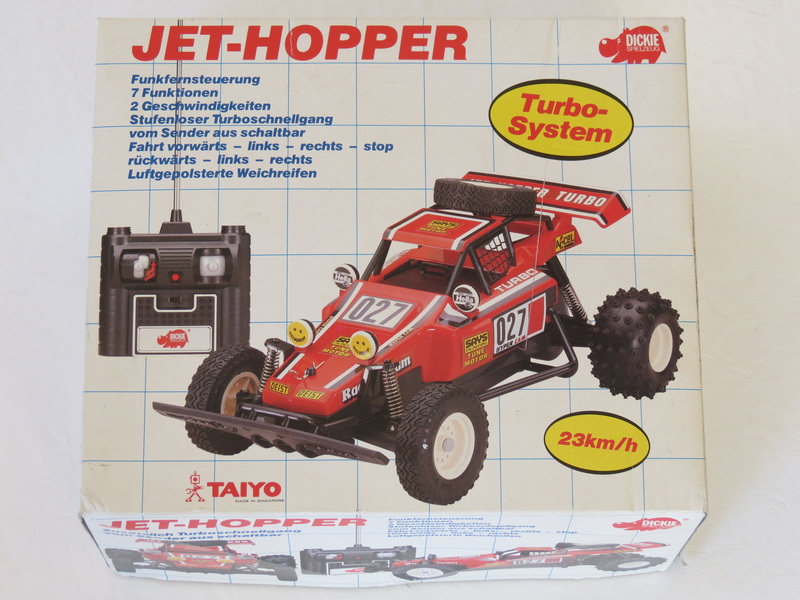 If you’d like to see many more detailed photographs and analysis of the car itself, and it’s performance and features, please visit the original Taiyo Jet Hopper page, along with the Tyco/Taiyo Turbo Hopper page, where I have covered this extensively. Let’s now look at some rare ads and images relating specifically to the Jet Hopper in Australia. I can still remember the first time I ever saw a Jet Hopper. A kid off in the distance at a park, was spinning the car around and around doing burnouts on a dusty bit of road. I wanted to go over there to ask if I could “have a go”, but the other kid seemed a bit older than me and I was too shy. So I just watched from afar, wondering if I’d ever own one myself. Today, I own more than my share of Jet Hoppers, and have probably blabbed more about them than anyone else on the Internet. So I feel like I’ve made up for those days of watching other kids “doing doughnuts” with Jet Hoppers, off in the distance. There can be no doubt that kids Australia-wide really went nuts for the Jet Hopper when it was released – it was truly a case of “right product at the right time”. 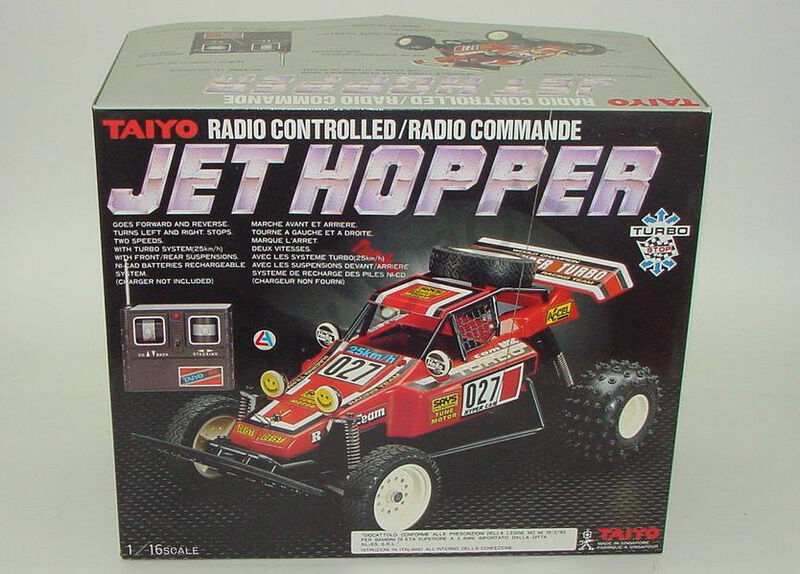 Kids were crazy about R/C as a whole in the mid 1980s, but the Jet Hopper represented a ready-to-go package of car and transmitter, combined with very Tamiya-esque looks that were quite scale-realistic. It wasn’t the first or the only ready-to-run R/C car with this combination, but it was early to market and had the right combination of features. And it’s no surprise to me that it outsold the nearest Tamiya 7-to-1, becoming one of the biggest selling toys (of any kind) in it’s day. Metro/Taiyo Jet Hopper in 1986 Toyworld catalogue. Toyworld is a chain of toy stores in Australia that is still operating today, though with far fewer stores than their heyday of the 1980s. 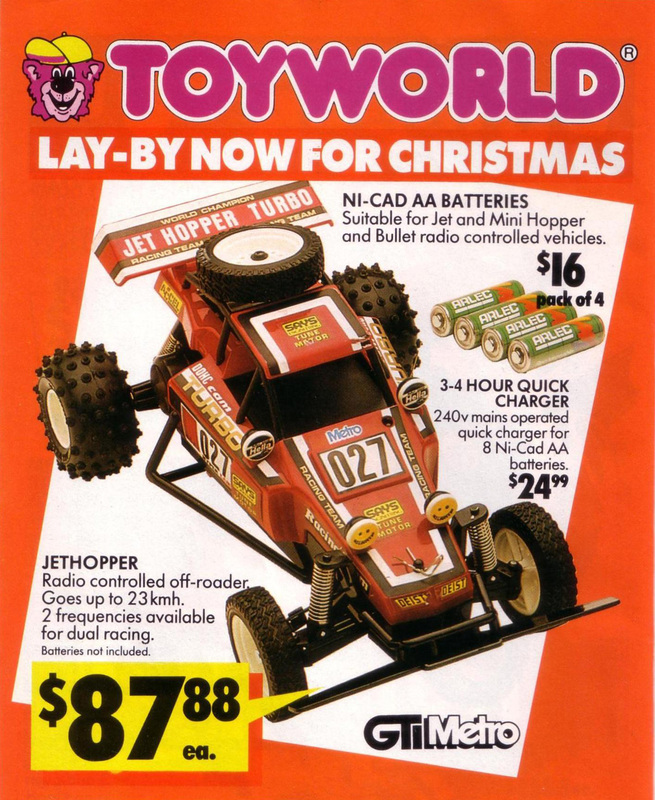 One of the great things Toyworld did was produce the occasional sales catalogue – usually a compact, almost pocket sized booklet. These booklets are unbelievably rare today, and sought-after by a myriad of toy collectors from Barbie to Transformers. I’ve done my best over the years to keep, and buy a few of these catalogues, or otherwise obtain scans from other collectors. Some of the following images are courtesy of another toy collector (thanks Brendan! ), who very kindly donated some scans of the Jet Hopper as it appeared in a couple of his 1987 Toyworld catalogues. To the right firstly, you can see an image I got hold of years ago, from a Toyworld catalogue in 1986. 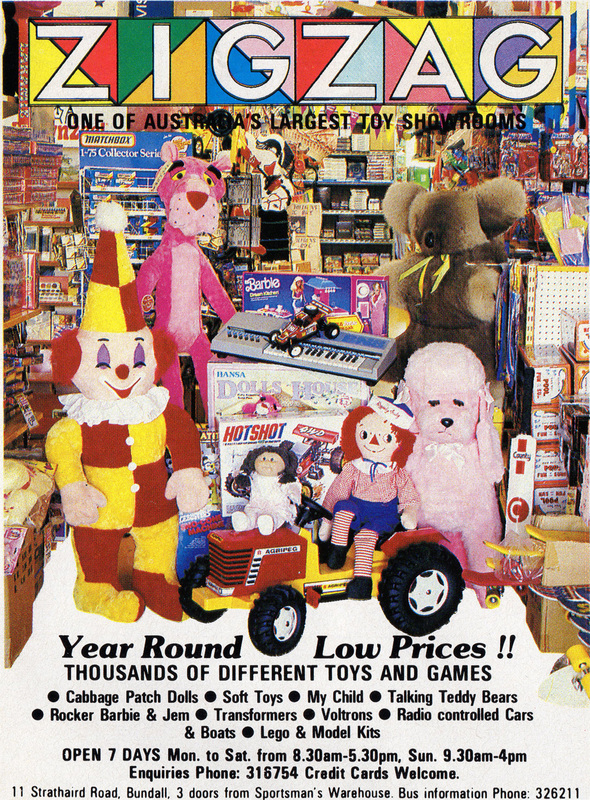 Very similar to Toyworld (they were in fact a partner chain of stores) were ZIGZAG toy stores, which mainly seemed to exist in the states of Victoria and Queensland. 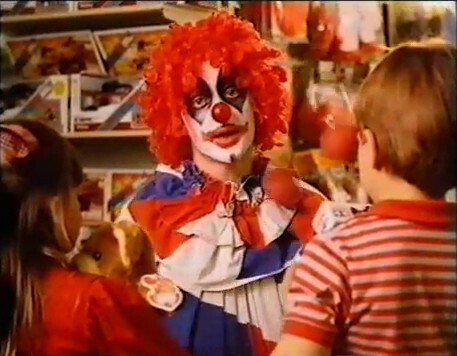 Another popular place for toys in the 80s, before the toy industry was essentially ruined by the arrival of Toys R Us, were department stores. In Sydney, the biggest department store was Grace Bros, while in Melbourne it was Myer. The two companies had merged and essentially become one entity by the 1980s, but continued to maintain different store names in each city for many years. Much like in the USA, K Mart stores in Australia are a chain of budget department stores. They have been in Australia for decades and continue to thrive today, however in recent years they have begun to sell a lot of very cheap, unbranded (low quality) rubbish. If you need to buy a toaster to last you a week, and you’ve got a tenner in your pocket, K Mart is where you go. 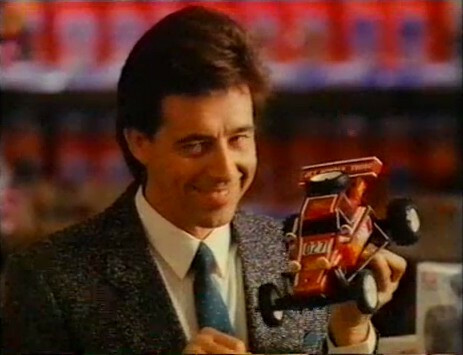 But back in the 1980s, K Mart actually sold quite a lot of quality, branded goods, particularly toys. Their stores were much better presented (they even had inbuilt cafés called Hollies), and I remember the days when some of their toy aisles even had long glass cases filled with things like Lego town and space displays. 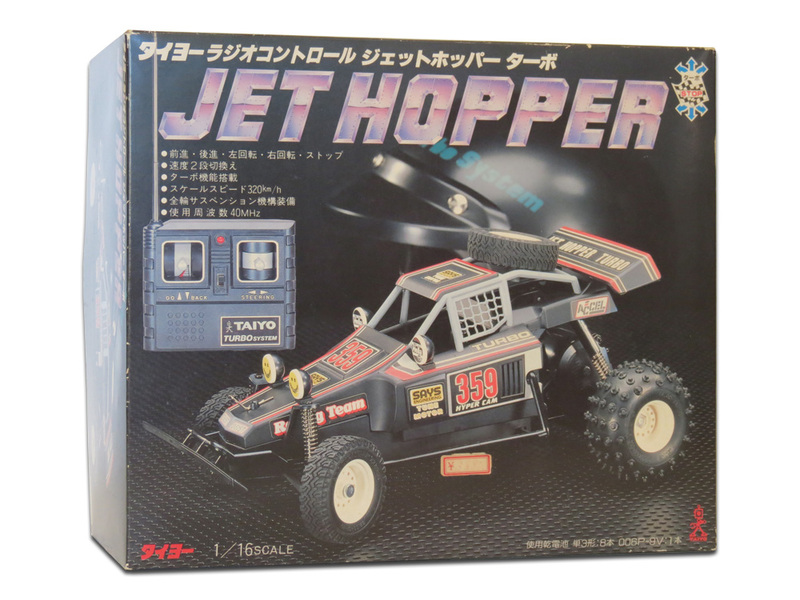 I also remember seeing many great R/C cars at K Mart when I was growing up – including Jet Hoppers, and even Tamiya kits. And while sadly, I don’t have a single shred of vintage K Mart catalogue print advertising to prove it, I did spot this frame of a 1980s K Mart ad on Youtube where you can see a pretty interesting shelf in the background… a shelf filled with new in box Jet Hoppers. That’s all for now, but if and when I find any more bits and pieces related to the Jet Hopper in Australia, I will be sure to post it here. One person has told me that he remembers a children’s show on Australian TV called The Early Bird Show, on which kids would sometimes win Jet Hoppers as prizes for various games and activities. Amazing times. Yep, you’re totally right Nidan. It was quite common in the 80s for cars to come in 2 frequencies, with each car a different colour (and sometimes bearing the frequency number as the racing number). Great to hear you and your brother had one of each, that must have been a fun Xmas morning! 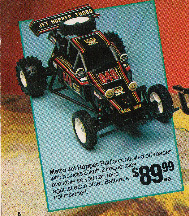 Just to be pedantic, the Early Bird Show used Marui RC jeeps for their racing segment, with the Marui Hunter being their major prize. Really? That’s amazing to hear actually 👍 Thanks for sharing. I don’t recall if they used them for the on-show races, but they also had the Nikko Bison F10 as a prize at points. That’s the one I distinctly remember. Have you ever encountered the Aero Jet Hopper? I had the regular original Metro Jet Hopper, as did half of my friends, and I recall seeing the mini one, but not sure I ever saw an Aero in the flesh. “The Early Bird Show” is also famous for another bit of footage. The show’s co-host, Marty Monster getting the snot belted out of him by a red kangaroo from Monbulk Animal Farm. A mate of mine had an Areo Hopper, I had the regular version. Areo’s were slightly quicker (rated 27kmh vs 23 kmh). I have the Tyco slot car versions of both. After the Jet Hopper, I got an Aero Phantom. Unlike the up/down left/right stick style controller the JH had, it had the trigger+wheel style controller. 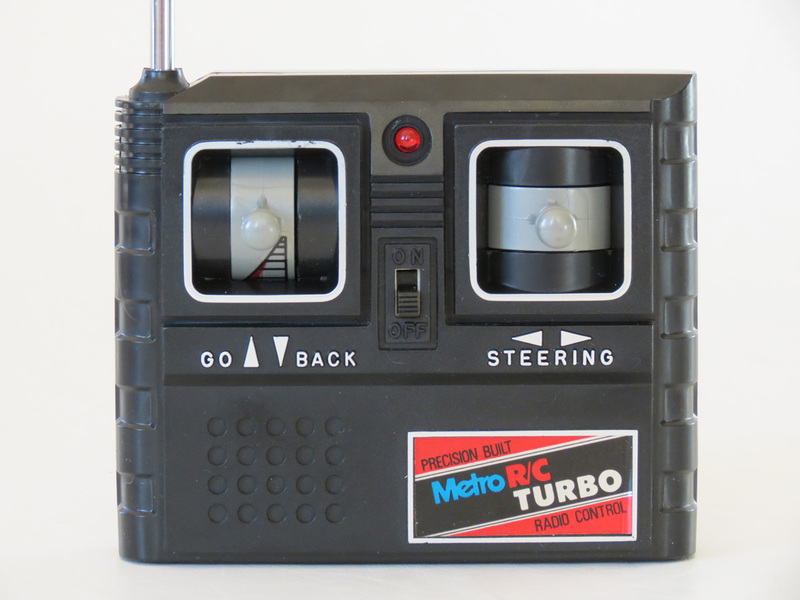 Using the standard JH controller, steering left or right would decrease the forward speed some, which helped keep it under control, but controlling a JH with the same freq Aero Phantom controller, you could get it to steer while still going forward full speed, making it possible to do much cooler doughnuts. If memory serves me correctly, turning the wheel on the Phantom’s controller was all you had to do, it’d automatically throttle forward and steer as well. This probably relates to how some models of the JH would only steer while moving forward/back. I haven’t seen any mention of the Phantom yet on this site. I’d be curious to have my memories verified if anyone has access to both cars. Never knew there were TYCO/AFX slot cars of the Jet Hopper/Aero Jet Hopper. That’s cool. I had a few TYCO/AFX sets over the years. The last one I had was the Daredevil Cliffhanger. I had an Aero Hopper. Same as you suggest- It had a radial steering control that could be used to control an earlier JH steering separate to direction control. I must say though, it seemed heavier than a JH and was definitely slower all over. It was beaten in a straight run numerous times by earlier JHs. Mine came from Myers Toowoomba. Like a lot of the little guys that shared the same circuit board, it eventually fried the mosfets for forward running and would only run in reverse. At the time we didn’t have the type of transisters here in Oz to repair them properly, so I bought another board from a supplier for $27. Lots of soldering later and it was up and running:-) Good times. From memory the first JH’s were supposedly capable of 23km/h, while the later Areo version was rated at 27. My mate’s Aero was a bit quicker than my JH.